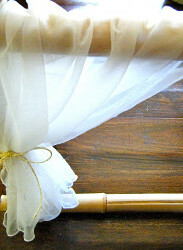 Here is a DIY home decor project for the one-and-only in your life. 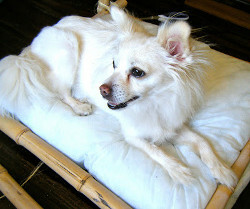 The Doggy Bamboo Bed from Erika Lindquist is at the forefront of do-it-yourself dog beds. It's one of those simple and easy crafts that will yield rewarding results for you and your canine companion. Simply gather your materials and read through these instructions to learn how to add some luxury into the life of your best buddy. Craft project ideas don't get much more adorable than this relaxing oasis for your pup. 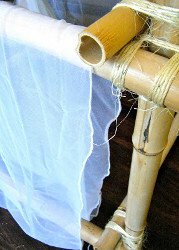 Cut the bamboo to size (easiest with a man...with a chop saw). To determine the size of your bed frame, measure the size of your dog bed and add a few inches on each side for the bamboo to overlap. 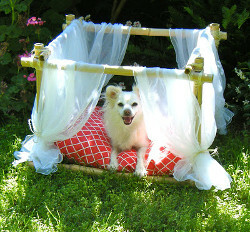 What's awesome about this project is you can use an already made dog bed that you have to place inside the bamboo frame. You can also make the frame as big or as small as you want it so virtually any sized dog can have one! This part is going to take two people. 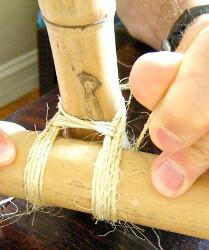 This is the "square" knot technique to combine the bamboo. 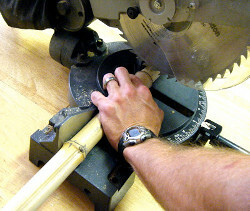 After you get the bottom frame done, give it a test fit with the bed you will use. 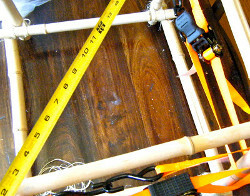 Next it's time to square that baby up as you attach the top frame. Repeat these steps for each corner of the bed frame. That's it! Well this is definitely a bed fit for a doggy prince or princess) My name has a little pooch who thinks she is royalty as she should think!! I feel she would definitely suit a bed like this, I am going to try make this for her and see what she thinks of it! Cool. I want to make one for my Ghost. She's my American Bulldog.